An unusual and very pretty royal doulton china trio. Pretty Royal Doulton 'Arvon' tea set. This lot is lot is a Cup/Saucer/Plate Trio. Light signs of use & gilding wear only. 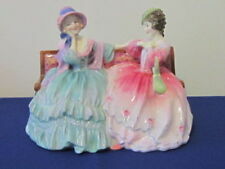 New listingRoyal Doulton. Sovereign H4973. 4 China Cups & 3 Saucers. Excellent Condition. Royal Doulton. Sovereign H4973. Fine bone China. This bone china plate has an embossed and richly gilded rim which surrounds a wonderful handpainted scene depicting Dover Castle in Kent. The picture is signed by the artist J. Hughes and is a high quality competent piece of art. Very Rare. Royal Doulton Porcelain. The Belgrade Pattern E7916. Hand Painted with pink rose buds, blue and green leaves. Orange trim. 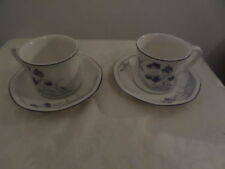 ROYAL DOULTON GRANTHAM DUO--COFFEE CAN & SAUCER--NUMBER D5477. 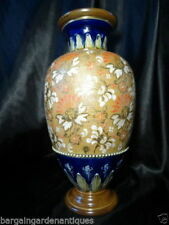 Has Royal Doulton Stamp to Base. Saucer------11.5 cms wide. Good Condition ---has very miniscule nibble to Can Base Rim which is hard to see when on display. Designed by Charles Noke. A rare shape to find, especially in such good order. 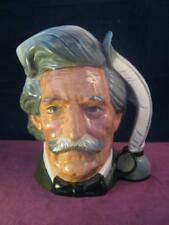 Special Dickens Ware mark to base along with painted series number D2973 (introduced in 1908). Four cup size (the smaller of two sizes produced), length from handle to spout 18cm / 7", height 12cm / 5". ROYAL DOULTON SERIES WARE SAUCER ~ SHAKESPEAREAN CHARACTERS - ROMEO ! A ROYAL DOULTON SERIES WARE SAUCER. SEASAW SCENE. SIGNED BARBRA VERNON. Royal Doulton Series Ware Coffee Can & Saucer depicting Bill Sykes. Hand Colouring on transfers, a quintessentially English piece. Pattern D5175 introduced in 1931, every piece is slightly different in Colouring. It has existed in several versions and styles. The pattern code E3804 indicates that this plate was produced on bone china beginning in 1906. There is tiny raised bits inside the cup towards the base. 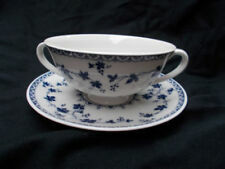 Doulton Burslem watteau cup & saucer blue/white/gold VGC. 2.5 inches high 10 inches round 5.5 inches across Dispatched with Royal Mail 2nd Class. ROYAL DOULTON YORKSHIRE ROSE SAUCERS 6"
The set consists of a small plate/saucer, a milk jug and a bowl. Royal Doulton Antique Soup Bowls & Saucer's. Two Soup Bowls & Matching Saucer Plates. N.B One soup Bowl has quite a crack which runs from both outside & Inside(Which has obviously happened many years ago). Royal Doulton Tea Set, Cup & Saucer. In good vintage condition. please see all pics. No cracks or chips. Here for sale is a lovely and rare set of 3 Royal Doulton saucer plates. Produced in 1911. Old royal doulton milk jug and saucer, in the 'old leeds sprays' pattern. There is wear to the paintwork, and scratches to the glaze of the saucer, the jug has crazing, which is quite stained on the inside bottom (I haven't tried to bleach it out), and there is a chip at the top by the handle, but it's quite hard to spot, but otherwise in a good condition.